Around the holiday season, giving wine as a hostess gift is common and always very welcome. 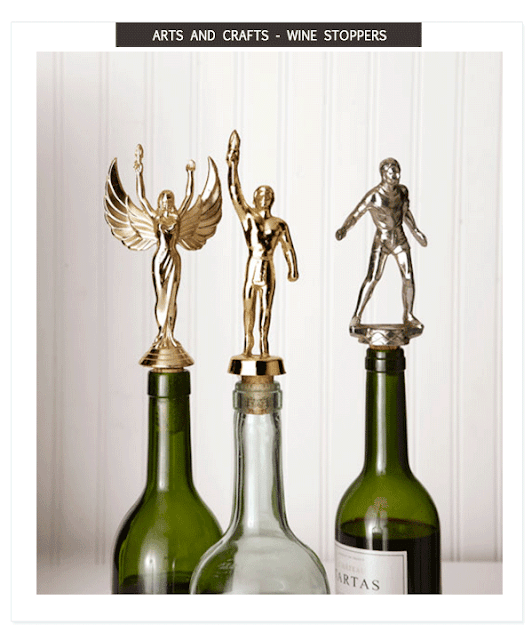 Why not up the gift idea with a fun wine stopper such as the trophy examples shown. Other toppers might be small china figurines, plastic toys, golf balls, billiard balls and glass dresser knobs. ■ Next, twist off the top of a vintage trophy (typically a few bucks each at thrift shops and garage sales). ■ Apply superglue to the underside of the trophy top's base and the screw that extends from it. ■ Insert the screw into the cork and twist the pieces together until flush and a tight bond forms. ■ Allow one hour of drying time before using your prize design.